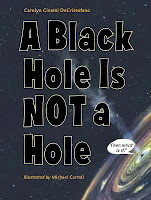 A Black Hole is NOT a Hole by Carolyn Cinami DeCristofano, illustrated by Michael Carroll. Grades 5-8. Charlesbridge, February 2012. 74 pages. Review copy provided by publisher. "A black hole is NOT a hole - at least not the kind you can dig in the ground or poke your finger through. You can't just walk along and fall into one. A black hole isn't a hole like that. Carolyn DeCristofano answers that question, writing in a conversational and humorous tone that will help young readers get their minds wrapped around the mysteries of space. DeCristofano approaches her subject step by step, first explaining that black holes are places in space that have a massive gravitational pull and then going into how they form and why they're called black holes (the gravitational pull is SO strong that even light can't escape!). She also addresses how black holes were discovered, how scientists "see" them, and how Einstein's way of thinking about gravity enabled scientists to predict and find the first black holes. Illustrations by Michael Carroll help illuminate the subject matter, presenting black holes in a visual way that will aid readers' understanding. Careful notation is made whenever images are not to scale and the artist's pictures are labeled as "artist's rendition" so as not to be confused with the photographs that are also included. Sidebars, designated with orange backgrounds, are laid out in sensible places so as not to detract from the main text and they add information. The book includes impressive back matter: a time line on the discovery of black holes, a glossary, a list of resources (books and websites), image credits, an index, and one of the best author's notes I've read in a long time. Titled "How Do You Know I Know? ", DeCristofano's author's note explains how she researched the book and emphasizes that science research is always going on and scientific facts change very quickly. She reiterates throughout the book that the facts as we know them in 2012 might have changed if someone's reading at a later date. I'm most impressed with this nonfiction book and I hope that you'll seek it out and take a look yourself! Hand it to young scientists along with The Mysterious Universe: Supernovae, Dark Energy, and Black Holes by Ellen Jackson and Nic Bishop. A Black Hole is NOT a Hole is on shelves now! Happy Nonfiction Monday! Travis has the roundup over at 100 Scope Notes!